Dockable Hard Disk Drive (HDD) recorder for JVC camcorders. DR-DV5000E module makes the GY-DV5001E a production and post-production tool in one. 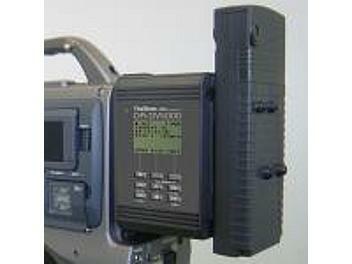 Docks directly to GY-DV5000/1 camcorder. Camera trigger controls record and pause (w/GY-DV5000/1). Disk status appears in camera viewfinder (w/GY-DV5000/1). Use inexpensive removable IDE drives. Compatible with popular DV NLE applications (no file transfer, no digitizing, no rendering). Retro loop Record (up to 8 seconds). Adds only 400g to camera weight. Up to 6.5 hours with 80 GB. Up to 8 sec of shock/gyroscopic protection. Daisy chain up to seven external drives. DR-DV5000 was co-developed by JVC and Focus Enhancements (see Videonics products).